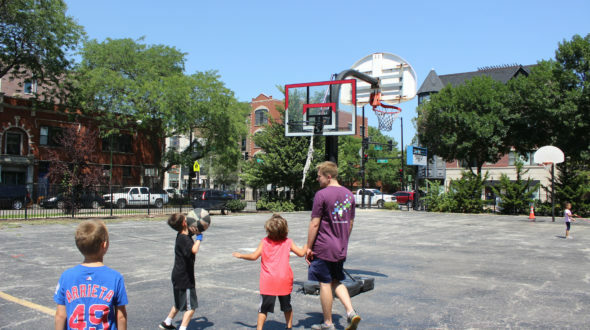 On Tuesday, July 18 a group of volunteers from Guggenheim Partners spent the day at Urban Initiative’s largest summer camp site, Jahn Elementary School. The volunteers spent their morning playing games, doing arts and crafts, and sweating it out in the hot summer sun with 40 Urban Initiatives students. They started the day with free play where volunteers helped students on the monkey bars and shot some hoops. Students got to know the volunteers and fast friends were made. After some formal introductions, the students broke into two groups by age. The younger group went inside to do some crafting and they took a cohort of volunteers with them. The day’s project was to create a collage that depicted your idea of the best summer day. The supplies were passed out and the creativity flowed freely. 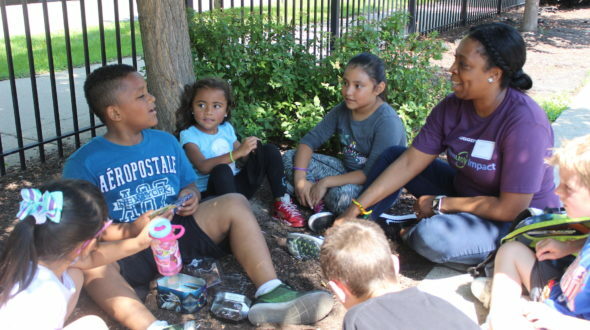 Students and volunteers used magazines, comic books, stickers, and googly eyes to create their best summer days. Collages included days at the beach, days at a Cubs game, and even a day in a rocket ship flying to outer space. The older students remained outside to play a large game of kickball. The competition was fierce and each team put forth a valiant effort. After the two groups rotated through each station, students had a quick bite of lunch before getting more time for free play and dodgeball. The students taught the volunteers hand clapping games and the volunteers taught the students new dances. 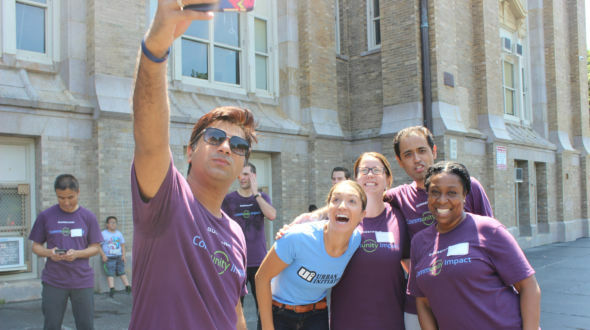 On a hot day with a large group of students, the volunteers from Guggenheim Partners stepped up to the plate and played hard. Everyone made new friends and everyone went home having learned something new. Urban Initiatives is already looking forward to the next time our friends from Guggenheim can visit!